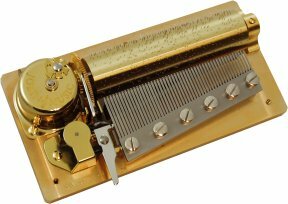 A superb quality musical movement from Switzerland playing 1 tune in 2 parts on a 50 note comb. The solid brass bedplate provides a good base for a rich beautiful sound. The movement plays 2 parts of the tune non stop, so it achieves a longer playing melody. One part plays, then a short well timed pause as the cylinder slides across to play the second part. For more information on the musical movements, please click here.